One more story of the UNSUNG…. At bombay…It was my regular train journey home from work. I boarded the 18:50pm train from Church Gate. Vendor: “On peak week days, we sell 4,000 to 5,000 samosas per day. I was speechless…..for a few seconds. He makes about 3,000 rupees daily, or 90,000 rupees a month. That’s Rs. 90,000 a month. OMG. “But one thing…most of our earnings are spent on living expenses here at Bombay. Palghar for 10 lakh rupees and I sold it a few months back for 80 lakhs. Me: “What did you do with the remaining amount? I have set aside 20 lakhs for my daughter’s wedding. DO NOT JUST THINK IT – INK IT! If you have a goal to achieve, write it down. Written goals transform wishes into wants, thoughts into action, cant’s into cans; dreams into plans; and plans into reality. WRITE IT DOWN in as many posters as you want, paste them all over your home, vehicle, especially places where you spend most of your time. Create a song and make it into your mobile tune… Every element around you should be talking to you. JUST DO EVERYTHING POSSIBLE TO PUSH YOURSELF TO REALIZE YOUR GOAL. There is nothing called failure, you actually give up. When you fall down and stay down, people say that you failed. Do not give up! Keep banging the door that you want to open. Open, it will. It depends on your passion and perseverance. As long as you do not give up, every door in this world can be opened. Just believe in yourself. Love. You cannot escape the inevitable, why procrastinate….. Kaal karey so Aaaj Kar, Aaaj Karey so ab…. JUST DO IT! Always under-promise and over-deliver…. Over achieving your objectives / targets is the biggest boost of confidence you can give for yourselves and for those who are betting on you. Good Judgment comes from a bad experience and Good experience comes from a bad judgment! Why hesitate, just jump and swim…. yes, be prudent in whatever you do! Believe in yourself and your judgments… Enjoy the journey! A story about two shoe salesman who happened to travel deep into the rain forest and chance upon a primitive tribe. The first salesman messages his boss, “NO opportunities here. All the people go barefoot.” The second one also sent a message, “Everyone here barefoot. Huge opportunity! Send all the possible sizes and styles”….. a favourite story of Akio Morita, founder of SONY. Discovery and innovation come out of seeing what everybody sees, but thinking and doing what nobody has ever done before. Do not be afraid to fail, just do it! Accept that people think differently than you do; Do not waste your time trying to convert the diehards. Instead, work with them, live with them, respect their differences, be open to learning from them, and be thankful the world isn’t full of people exactly like you. How true this statement is. The way Mallika Nethra Sreenivasan and Svwara go about their explorations, in fact make them the best teachers I have ever had in my life. I need to have more patience to explore and learn as much as I can. Thanks to Indira for making life more meaningful. Don’t Expect gratitude! You may get it but don’t expect it. Do whatever you do because it’s right, because it pleases you; Your reward should derive from the fruit of your labours, not the arbitrary whim of disinterested recipients. And when that infrequent expression of gratitude comes your way, humbly accept as it will be that much sweeter. While traveling around the country interacting with youngsters, many who are studying in best of the institutions like IITs and other prestigious colleges, and who claim and want to get into institutions like IIMs, but do not have any purpose or goals defined. They say they want to do MBA, but do not know anything beyond saying ‘Good job’, ‘good salary’, ‘enhancing ones skills’ and so on. When I ask them what did they learn in the current course they are pursuing, they are either blank or retort saying that ‘I learnt nothing here, hence I want to do MBA’. Unsung Heroes is a series featuring men and women who are omnipresent in the street corners or on occasions, who people hardly take notice of or talk about; But they are the ones who believe in ones own dream, chase their calling in life and have realized their dream. 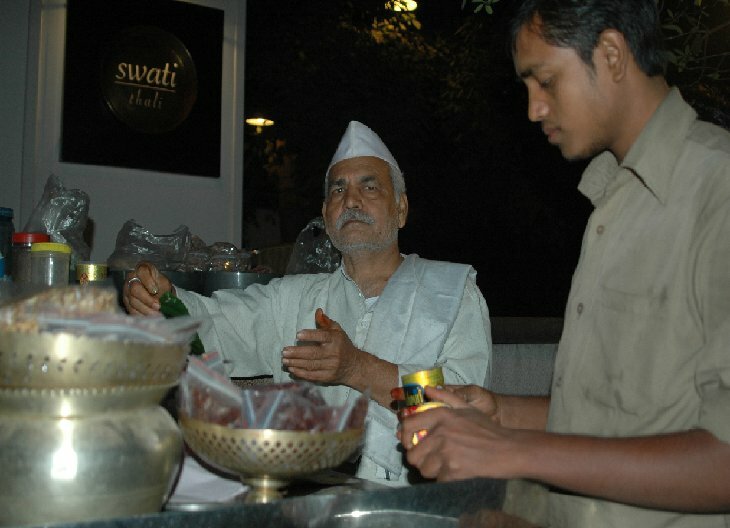 My friend Ajesh, an erudite edupreneur and a CL family member in Ahmedabad, asked me whether I would be interested in having typical Gujarati snacks at a much sought after restaurant SWATI Thali in Ahmedabad in the month September, 2010. I jumped at his offer. I realized how popular the restaurant is by the waiting numbers outside the restaurant. We too took our seats in the queue to be ushered in. While waiting, I noticed an elderly gentleman in his dhoti, kurta and a typical Gandhi cap briskly making paan, while a couple of youngsters are catering to the cutomers by reaching out the paan they were seeking from ice-boxes that already have stacks of paan. As is my wont, I was keen on talking to the elderly gentleman, but he was so busy that I was observing the way the production of paan was carried out, the customer service, friendly smile and quick comment being passed on. I could go no further as our turn came to get into the restaurant. The snacks that we had in the restaurant were out of this world. The story about ‘Swati Thali’ is another one. I shall retrict myself to the elderly gentleman caterging paan now. When we emerged out of the restaurant, still he was as busy. I had a quick word with him, appreciating the way he was conducting the business, with a promise to catch up with very soon when I visit next. On the eve of Republic Day, 2010, I was once again in Ahmedabad and I grabbed Ajesh’s offer to get to Swati. This time, fortunately, it was not a weekend and the crowd at the paan shop was not as thick. I went up to the elderly gentleman after a while, when he took a break from packing paans, and sought time to interact with him. Mr Jainarayan Nag came to Mumbai in 1965 from Jaunpur in Uttar Pradesh looking for better opportunities. Quickly realized that his forte of Paan making is the one he can rely upon to earn his livelihood. He proudly shared that industrial stalwarts – singhanias, Bajajs, Ruias – film stars Kapoors, Kumars who have been his clients for five decades. He fondly recalled the interactions he had with Ramakrishna Bajaj, Raj Kapoor, Ashok Kumar..
His eyes twinkled when he spoke in his inimitable style how he was compelled to travel around the world for his paan business by his ‘fans’. He threw names of five star hotels in Hongkong, Bangkok, Dubai, London etc. where he has catered paan to many a marriage from business families at their special invitation. He mistook me to a journalist, and went on to share that Business newspapers and television channels have interviewed him; And he figures in many a story on the internet, which he only heard of from his clients!! I was a little inquisitive about what his children must be doing. He shared that he has only son and he takes care of the paan outlet at Ahmedabad’s number 1 club. He also caters paan at the second biggest club at Ahmedabad. I went on to gather that he now has two outlets in Mumbai and three in Ahmedabad. I humbly asked a question “Jainarayan ji, on an average how many paans do you sell in a day at Swati thali paan bandaar”. He immediately told me that “Nahi Nahi, Yeh sawaal nahin poocha jatha hai, na hi jawaab diya jatha”. I apologized for asking that question, as I was just curious to write about this story to inspire youngsters to really think big and commit themselves for their passion. Jainarayan ji is busy in only creating the ‘paan bank’ and not preparing it when the customer asks for it..
“Aapka naya flat kitna bada hai” – 3000 sq ft.
Jainarayan ji, starts his ‘Swati paan bhandar’ at 11am and closes it at midnight. While waiting and watching him for an hour during the busy part of the day, he must have sold about 200-300 paans in an hour. If I consider six hours of his day are busiest and the other seven hours the demand is only half of the busy hour, even then the sales estimation for that particular bhandaar is about 2000 paans per day. Across the five outlets (three in Ahmedabad, and two in Mumbai), the modest estimates could be nothing less than 10000 paans a day. That amounts to almost Rs 1.5Lacs topline every day from his five outlets, not to talk of any of the events. What is the annual turnover???? if not a 6-7 crore bizz, at least a 2 crore one at the bare minimum!! , not considering Jainarayan ji’s parties and shaadis in India and Abroad at the invitation of the Industrialist friends!! Naturally “Yin cheejon ke bhare mein baat nahin karte” – We do not talk about these things !! I asked Jainarayan Nag, why he has not ventured into the internet space with his website. I told them it is possible that he may get orders from abroad too for his paan. He responded saying that “many people going abroad, order for a few hundred paans and get it packed”, and he is open to creating the website if I could find a couple of youngsters who can create one. Next day while talking to a couple of hundred youngsters at Ahmedabad at NIRMA university, i threw this idea to them. If only any youngster could create a website for Jainarayan Nag’s “Swati Paan Bhandaar” and asks for 10% of the profits generated through the web! !